We are here in Pinckneyville, Perry County, Illinois at the Timpner Family Fish Farm. Perry County is in Southern Illinois. It is seven hours south of Chicago, the largest city in Illinois. We live a half an hour from Southern Illinois University located in Carbondale, Illinois. We are in the Mississippi River Watershed. We actually live about two hours east of the Mississippi River and St Louis, Missouri. The closest tributary to us is called the Big Muddy River. We are known for our agriculture in Illinois. We are rated number one in soybean production and number two in corn production this year. We are always number one in Pumpkin production. We are in the southern portion of the state. It is not near as productive as the central part of the state where prairie grass once covered the land. Our area is known as Little Egypt. Around 1830 we were plagued with severe and long winter months in Central and Northern Illinois. The winter dumped three feet of snow or more and we received early frosts in the fall. It was the severest and coldest weather ever recorded in the state of Illinois and persisted for several years in a row. The Northern Illinois farmers could not raise the grain needed to sustain their families. Southern Illinois was not hit as hard and had plenty of reserves that they loaded up in wagon caravans and shared with the people in the North, helping them survive. We became known as Little Egypt, recalling the Biblical stories of the famine in Palastine. 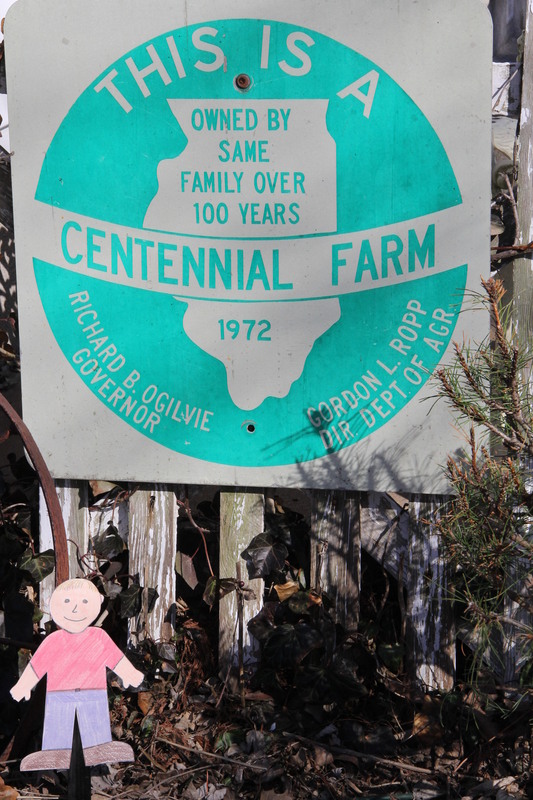 In 1972, the Timpner family was recognized as a Centennial farm by the governor of Illinois. The Timpner farm is a grain farm as well as a fish farm. The fish farm began due to the large lakes that were left after coal mining. Southern Illinois is known for coal production. Many of the mines are strip mined. This means that they take the soil layers out in strips from the surface which makes a large indent in the form of lakes. Our lake is 80 acres and about 50 feet deep. It is called prelaw. This means that it was dug before land reclamation laws and the land was left the way it was when they were done. It was not cleaned up like they do today according to law. This provided a large body of water for us to use for recreation and farming. Our farm began as a dairy farm in the 1800’s. It has been in our family for 6 generations. It has changed over the years but remains an area landmark because of the large 100 year old Dairy barn still noticeable from the road. 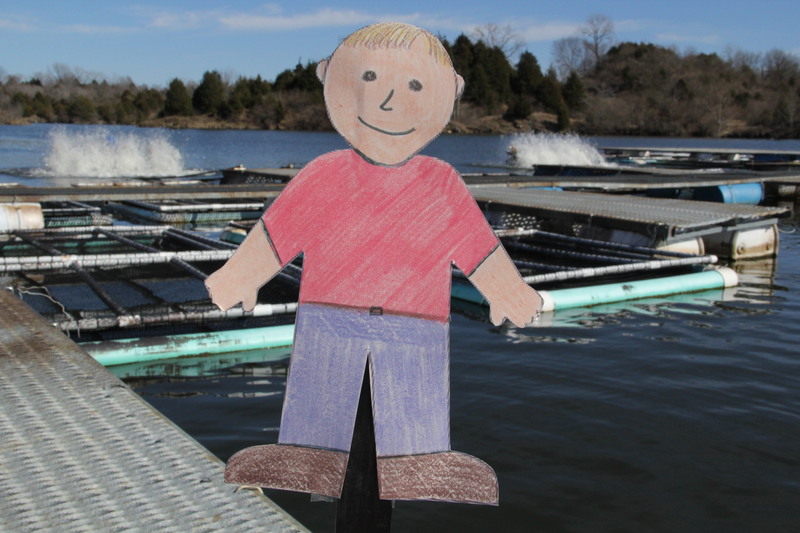 Today, we are known for raising fish in our strip cut lake. 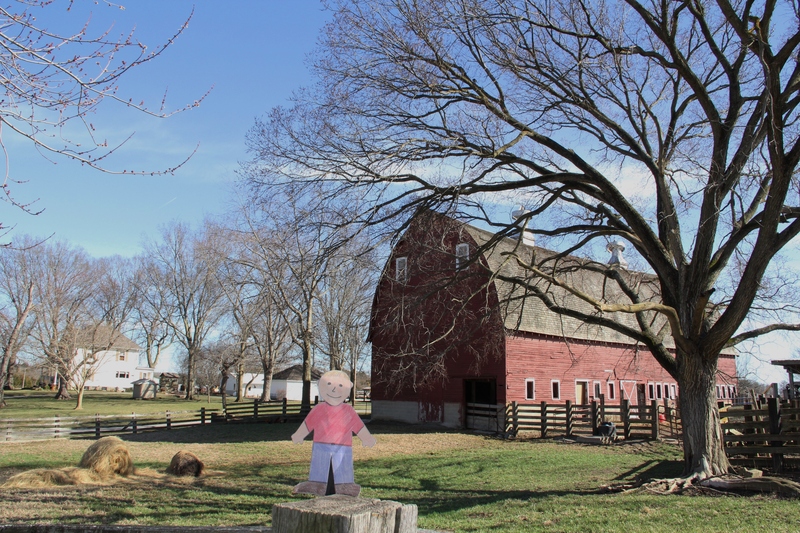 Our dairy barn is well-known and hard to miss. Visiting the baby fish or fingerlings. These fish are 5 to 6 inches long. The fish we raise are mainly Hybrid Stripe Bass. We ship them in at fingerling size, (about three inches long). They are raised in pens that float in the water. The pens are made of plastic coated wire and float by a PVC ring that is full of Styrofoam. They measure 6 feet deep x 16 feet long x 8 feet across. We keep the fish until they are about 1 ½ pounds. This takes about 15 months. The fish are dormant during the winter. This means they are alive but their body temperature lowers and they do not eat until the water is above 50 degrees Fahrenheit. We feed them twice a day. They eat a food that is mainly fish meal and soybean. This means they get a lot of protein. They grow quickly during the warm summer months. Many wild species of fish feed around our cages of stripers. The food gets thrown about by the stripers as they eat. This makes food available outside the cage too. Turtles and Canadian Geese also benefit from the thrown feed. 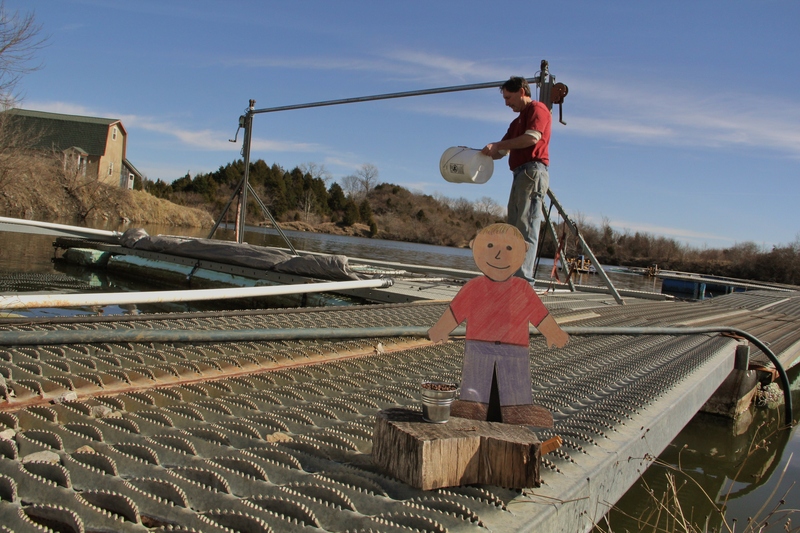 Flat Aggie helps owner, Bill Timpner feed fish. Our fish are mainly sold to a buyer in Toronto Canada. Hybrid Stripe Bass are a delicacy in the Asian market there. The truck will load about 3,000 to 5,000 pounds of live fish per visit. They load the fish into storage tanks that we fill with lake water and ice to cool them down for their long haul to Canada. Our fish bring about $4.25 per pound live. It takes several people to complete a harvest. We must net them by hand to avoid stressing the fish. Too many in the net at a time will stress them and they will die within just a few hours. The paddle wheels keep the water in the ponds moving. We run paddle wheels on the water to stir the water and keep it flowing around the cages. Oxygen is critical to the survival of our fish. The paddle wheels help stir fresh water past the cages. 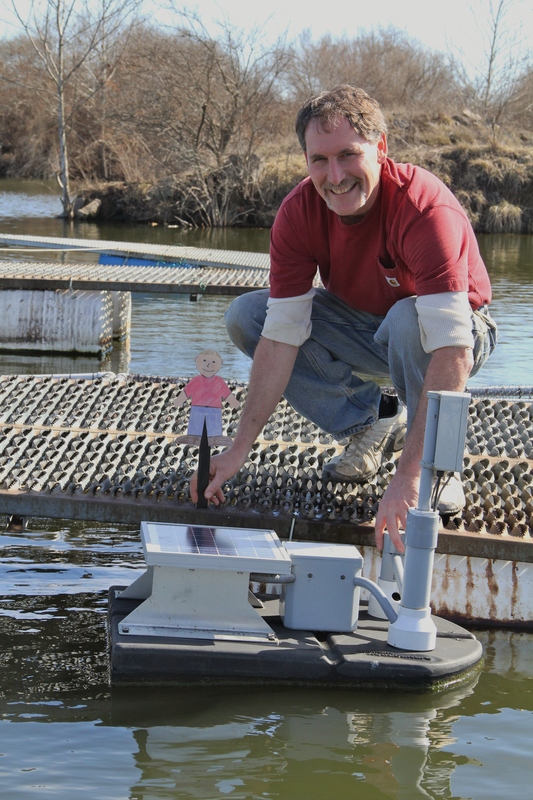 We have a solar powered wireless oxygen sensor that monitors the oxygen levels and the water temperature. It aids us to keep an eye on the water quality and keep our fish healthy. Fish farming is becoming a big business in Illinois. Our farm is a pioneer farm for cage culture fish farming. We are very proud of our farm! Flat Aggie helps Bill check the oxygen sensor. 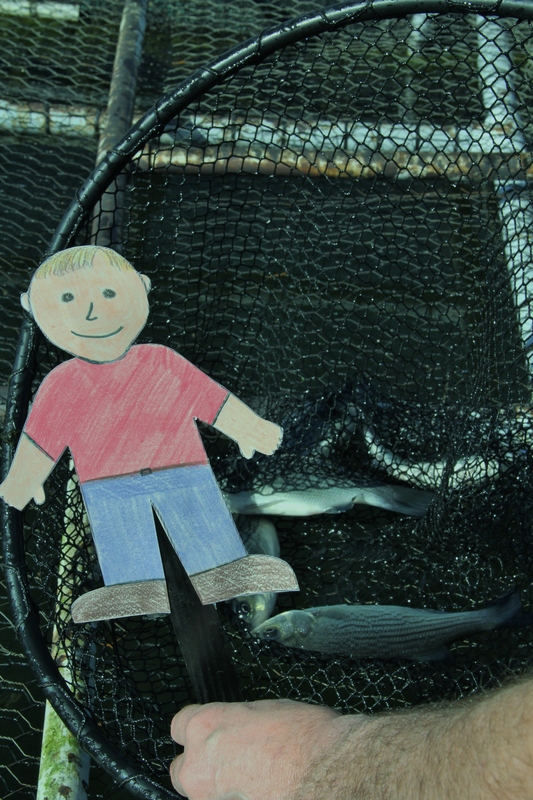 This entry was posted in Ag in the Classroom and tagged Ag in the Classroom, fish farm, Flat Aggie. Bookmark the permalink.